An automaton (plural: automata) is a self-operating machine. The word is sometimes used to describe a robot, more specifically an autonomous robot. Used colloquially, it refers to a mindless follower. Automaton, from the Greek, automatos, “acting of one’s own will, self-moving bowels,” is more often used to describe non-electronic moving machines, especially those that have been made to resemble human or animal actions, such as the jacks on old public striking clocks, or the cuckoo and any other animated figures on a cuckoo clock. The automata of Ancient Greece were intended as toys or tools for demonstrating basic scientific principles, including those built by Hero of Alexandria (sometimes known as Heron). When his writings on hydraulics, pneumatics, and mechanics were translated into Latin in the sixteenth century, Hero’s readers initiated reconstruction of his machines, which included siphons, a fire engine, a water organ, and various steam-powered devices. There are also examples from myth: Daedalus used quicksilver to install a voice in his statues. Hephaestus created automata for his workshop; Talos, an artificial man of bronze; and, according to Hesiod, the woman Pandora. Medieval Persian alchemist Jabir ibn Hayyan included recipes for constructing artificial snakes, scorpions, and humans which would be subject to their creator's control in his coded Book of Stones. Al-Jazari is credited for the first recorded designs of a programmable automaton in 1206, as well as a set of humanoid automata. Villard de Honnecourt, in his 1230s sketchbook, show plans for animal automata and an angel that perpetually turns to face the sun. Leonardo da Vinci sketched a more complex automaton around the year 1495. The design of Leonardo's robot was not rediscovered until the 1950s. The robot, which appears in Leonardo's sketches, could, if built successfully, move its arms, twist its head, and sit up. The device was built (with a few modern mechanical advances in mind) and it actually functioned. The Renaissance witnessed a considerable revival of interest in automata. Hero's treatises were edited and translated into Latin and Italian. Numerous clockwork automata were manufactured in the sixteenth century, principally by the goldsmiths of the Free Imperial Cities of central Europe. These wondrous devices found a home in the cabinets of curiosities or Wunderkammern of the princely courts of Europe. Hydraulic and pneumatic automata, similar to those described by Hero, were created for garden grottoes. A new attitude towards automata is to be found in Descartes when he suggested that the bodies of animals are nothing more than complex machines - the bones, muscles and organs could be replaced with cogs, pistons and cams. Thus mechanism became the standard to which Nature and the organism was compared. Seventeenth-century France was the birthplace of those ingenious mechanical toys that were to become prototypes for the engines of the industrial revolution. Thus, in 1649, when Louis XIV was still a child, an artisan named Camus designed for him a miniature coach, and horses complete with footmen, page and a lady within the coach; all these figures exhibited a perfect movement. According to P. Labat, General de Gennes constructed, in 1688, in addition to machines for gunnery and navigation, a peacock that walked and ate. The Jesuit Athanasius Kircher produced many automatons to create jesuit shows, including a statue which spoke and listened via a speaking tube. The world's first successfully-built biomechanical automaton is considered to be The Flute Player, invented by the French engineer Jacques de Vaucanson in 1737. 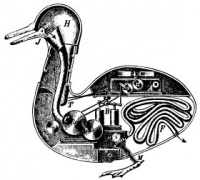 He also constructed a mechanical duck that gave the false illusion of eating and defecating, seeming to endorse Cartesian ideas that animals are no more than machines of flesh. Other 18th century automaton makers include the prolific Frenchman Pierre Jaquet-Droz (see Jaquet-Droz automata) and his contemporary Henri Maillardet. Maillardet, a Swiss mechanician, created an automaton capable of drawing four pictures and writing three poems. Maillardet's Automaton is now part of the collections at the Franklin Institute Science Museum in Philadelphia. According to philosopher Michel Foucault, Frederick the Great, king of Prussia from 1740 to 1786, was "obsessed" with automata . According to Manuel de Landa, "he put together his armies as a well-oiled clockwork mechanism whose components were robot-like warriors." Japan adopted automata during the Edo period (1603-1867); they were known as Karakuri. The famous magician Jean Eugene Robert-Houdin (1805 - 1871) was known for creating automata for his stage shows. The period 1860 to 1910 is known as "The Golden Age of Automata". During this period many small family based companies of Automata makers thrived in Paris. From their workshops they exported thousands of clockwork automata and mechanical singing birds around the world. It is these French automata that are collected today, although now rare and expensive they attract collectors worldwide. The main French makers were Vichy, Roullet & Decamps, Lambert, Phalibois, Renou and Bontems. Contemporary automata continue this tradition with an emphasis on art, rather than technological sophistication. Contemporary automata are represented by the works of Cabaret Mechanical Theatre in the United Kingdom and Dug North and Chomick+Meder in the United States. A fascinating evolution of the mechanized toys developed during the 18th and 19th century is represented by automata made with paper. The possibility to export the complete design throughout the world with a simple click of the mouse gives paper automata (and in general paper modelling) a great impact. Despite the relative simplicity of the material, paper automata intrinsically are objects with a high degree of technology, where the principles of mechanics meet the artistic creativity. Popular sites where to find paper automata are, among others: CeraCera, paperPino, Flying Pig, Paper Machines Saka Karakuri. Other notable examples of automata include Archytas's dove, mentioned by Aulus Gellius, Noct. Att. L. 10; and Regiomontanus's wooden eagle and iron fly, the former which, as Hakewill relates, flew forth of the city, met the emperor, saluted him, and returned. It is said that the iron fly flew out of Regiomontanus's hands at a feast, and taking a round, returned to him. Similar Chinese accounts of flying automata are written of the 5th century BC Mohist philosopher Mozi and his contemporary Lu Ban, who made artificial wooden birds (ma yuan) that could successfully fly according to the Han Fei Zi and other texts. The Smithsonian Institution has in its collection a clockwork monk, about 15 inches high, possibly dating as early as 1560. The monk is driven by a key-wound spring and walks the path of a square, striking his chest with his right arm, while raising and lowering a small wooden cross and rosary in his left hand, turning and nodding his head, rolling his eyes, and mouthing silent obsequies. From time to time, he brings the cross to his lips and kisses it. It is believed that the monk was manufactured by Juanelo Turriano, mechanician to the Holy Roman Emperor Charles V.
The Crooked Hinge (1938) by detective novelist John Dickson Carr. It combines a seemingly impossible throat-slashing with elements of witchcraft, an automaton (locked in a bookcloset in the attic) modelled on Maelzel's Chess Player, and the story of the Tichborne Claimant. L. Frank Baum's Tik-Tok, the "Mechanical Man of Oz", is a sentient man made of clockwork. K. W. Jeter's 1987 Infernal Devices features an intelligent automaton called the Paganinicon. In August Eschenburg, Pulitzer Prize-winning author, Steven Millhauser, writes the story of a clockmaker's son who spent his life building fantastical automata in 1870s Germany. In the 1993 role-playing game Ultima VII Part Two: Serpent Isle, automata were used by the local inhabitants. It was possible to create an automata via the create automata spell, which could then join your party. In 2000 video role-playing game Grandia II, the automata were soulless battle machines invented during the war between Granas and Valmar (good and evil god, respectively) about 10,000 years prior to the events of the game. One of them, Tio, joins the player's party at a certain point. In 2002 adventure game Syberia and its sequel, Syberia II, the automata were a key plot device crucial to completing the main quest. In the 2003 PC strategy game Age of Mythology: The Titans, the automata are Atlantean myth units that can repair one another. In 2006, Square Enix introduced the Automaton into the world of Final Fantasy XI Online as a new gameplay feature in the Treasures of Aht Urhgan Expansion Pack. Automata feature as a higher level enemy in the videogame Morrowind. Popular children's and young adult author Philip Pullman has written a book entitled Clockwork, which deals with automata. The 2006 Doctor Who episode The Girl in the Fireplace featured dangerous space-age automata from the 51st Century running rampant in the 18th century. The Vinci nation from the 2006 real time strategy game Rise of Legends use automata such as the Clockwork Man and Clockwork Spider to supplement their army. In the Anime Love Hina, there is an automaton called Moé that looks like a 1900-styled doll and is capable of autonomous movement. The doll was obtained in 1900 at the World's Fair in Paris, France by the great-grandfather of Keitaro (the main character of the series). It is seen in Episode 20, where Kaolla Su identifies it as an automaton. In the 1972 movie Sleuth, Andrew Wyke's manor house contains many antique automata. In the 1982 futuristic science fiction movie Blade Runner, geneticist J.F. Sebastian lives in an abandoned and crumbling but palatial apartment which he stocks full of robots, but also clockwork automata and cuckoo clocks. In the Mortal Kombat series, 3 characters (Smoke, Cyrax and Sektor) are automata. In Neuromancer, William Gibson describes an elaborately and elegantly constructed talking head employing mechanical synthesis. Automatons feature heavily in the fantasy card game Magic: The Gathering. The game features an entire sub-class of animate artificial creations, called artifact creatures; these range from clockwork automata to traditional clay golems. The game also deals with an expanse of parallel dimensions, including two worlds (Mirrodin and Phyrexia) inhabited by sentient machines. In The Invention of Hugo Cabret, the plot revolves around a child's attempt to fix an automaton. The comic series Girl Genius features automata called "clanks" very heavily. Unless indicated otherwise, the text in this article is either based on Wikipedia article "Automaton" or another language Wikipedia page thereof used under the terms of the GNU Free Documentation License; or on original research by Jahsonic and friends. See Art and Popular Culture's copyright notice. This page was last modified 19:40, 14 February 2010.